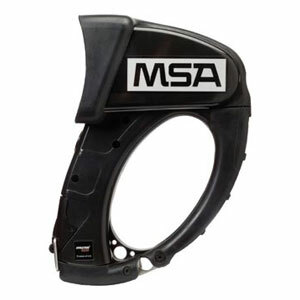 MSA has succeeded, with the aid of the latest technologies, in accelerating the Evolution 5000 series and in helping people master the element fire by the most modern means. Four Thermal Imaging Camera [TIC] models have been developed to suit all your needs and applications. All models feature the same ergonomic design, robust components and extreme durability. The image quality is best-in-class. The individual features of each TIC model have been designed to meet the specific requirements of a variety of tasks and applications. The practical modular system allows all four types of camera to be enhanced with a Video Transmission System or a Video Capture. The Video Transmission System gives the back-up team insight into what is happening on the fire ground in real time. Furthermore a unique Video Capture for documentation purposes is easily adaptable to all four cameras. User-Friendliness - All components of the Evolution 5000 series feature ergonomic, compact and lightweight design with convenient single button operation. The four cameras, the Video Capture and the Transmitter resist ingress of dust, water, heat, flame, impact, dropping as well as vibration. All components are tested to highest standards. Moreover the cameras are designed to float, which is useful in extreme situations. Sensor Performance - Today's TIC sensors are made up of thousands of pixels on a chip of the size of a fingernail. Working together, those pixels measure thermal energy and then convert that measurement into an image. Evolution 5000 TICs feature an uncooled vanadium oxide microbolometer sensor, which is small and lightweight but which nonetheless offers high image quality. MSA's four TIC models have different resolutions in order to ensure the optimal cost-performance ratio for each application. Image Quality - The superiority of the image quality results physically from the very high ISDR [Instantaneous Scene Dynamic Range] value of 4795 for the Evolution 5800, 5200 HD and 5200 models. The higher the ISDR value, the more sensitive the measurement and the higher the measurement range of each mode. This is achieved through an expansion of the dynamics as well as an increase in the measurement range of each mode. Thus the Evolution 5800, 5200 HD and 5200 models in High Sense mode have a sensitivity of 0.065 °C in a temperature measurement range of up to 160 °C. Sensitivity Modes - All Evolution 5000 cameras feature two different temperature sensitivity modes. High Sense Mode - For a low ambient temperature up to 160 °C. The higher sensitivity provides finer grading in a lower dynamic range. Low Sense Mode - For a high ambient temperature up to 560 °C. Thanks to an increased sensitivity in a higher dynamic range the Low Sense Mode in the Evolution models allow detailed views of objects in high temperature environments - even behind a fire source. It offers market leading image quality. Instant Mode Switching - If more than 32% of the thermal image is saturated in the High Sense Mode, the Evolution 5800 and the Evolution 5200 HD switch automatically to Low Sense Mode. The Evolution 5600 and 5200 cameras switch at 15% saturation. This switching takes less than one second and prevents the user from missing information. Shutter Indicator - The Shutter Indicator notifies the user if automatic calibration is running. This is shown by a green square in the upper left corner of the display during the shutter cycle, a safety feature unique to MSA. The loss of important information is thus avoided. Heat Seeker PLUS - The revolutionary Heat Seeker PLUS technology with colour pixels ranging from light yellow to dark red indicates changes in structural temperature. This is essential for determining the intensity and direction of a fire and creates thermal images in a quality never achieved before. Shutter Indicator - The Shutter Indicator notifies the user if automatic calibration is runn ing. This is shown by a green square in the upper left corner of the display during the shutter cycle, a safety feature unique to MSA. The loss of important information is thus avoided. Standby Mode - With one simple press of the button, each of the cameras in the Evolution 5000 range will go into Standby Mode. In order to preserve battery lifetime, the display switches itself off. Temperature Measurement - When using temperature sensing on a TIC, the accuracy of the temperature reading can be affected by the aspect ratio of the sensor. With an aspect ratio of 20:1, the further the TIC is from the hot object, the less accurate the temperature measurement is, since it will be giving the average temperature of everything located at the scene. The Evolution 5000 models have a sensational aspect ratio of 85:1 for pinpoint accuracy. The area of the target over which the temperature is measur ed depends on the distance to the target. The ratio is approx. 85:1, i.e. at 85 m distance the area being measured will be under 1 m.
Quick-Temp - An MSA exclusive: The advanced feature "Quick-Temp" displays the temperature read out in two ways: with a temperature bar and with a digital readout. The High Sense Mode is indicated by green temperature symbols, while the Low Sense Mode has blue temperature symbols. Display - All Evolution 5000 models feature an 8.9 cm display making it easier for multiple users to see the screen simultaneously. Digital Zoom - The Evolution 5800 and the Evolution 5200 HD have an optional highly functional 2 x digital zoom for enhanced picture imagery in Fire Service applications like search and rescue. This feature is of particular value in situations requiring closer observation. Enhanced Imagery and Colour Palette - The Image Detail Enhancement [IDE] software improves the imagery so that it matches the total dynamic range of the original view. It makes image details visible, even in scenes with extremetemperature dynamics. The Evolution 5800 combines this enhanced imagery with five user-selectable palettes, to give fire fighters a customized image that maximizes the scene information you need for your plan of attack, even in low-contrast environments. Power Supply - The lithium ion battery used in the entire Evolution series is state-of-the-art: smaller, lighter, lower maintenance and without memory effect.